Reagan is over her ear infections and she's back on iron for her anemia. She held her breath and passed out 3 times last week. The third time I just couldn't handle it and gave her to Brian to take care of. I love her, I love her, I love her... but she exhausts me. This week on the iron supplement she seems to not hold her breath for quite as long, making her able to catch her breath, not pass out, and just continue on crying. I'm grateful for that! Getting her to actually TAKE the medicine this week has been rough though. She knows what it is and just plain doesn't want it. Madison has been totally funny recently. Last night, she woke up at 4:00 AM and said "Dad, you missed my bed". Missed your bed??? "Yes, you missed my bed and you're in here on this one" pointing to our bed. "You're supposed to be in my bed. You missed it." That and she'll say (again at night time...) "ummm... I need a DAD in my bed..." She and Brian have a really cute relationship. She's loving the pool this summer and wants to go in it every day. And Taylor graduated from purple belt to blue belt. Jordan doesn't take it quite as seriously as Taylor does, but he really enjoys it. I think we might take a break this summer, but start up in fall again. Taylor really wants to advance further. 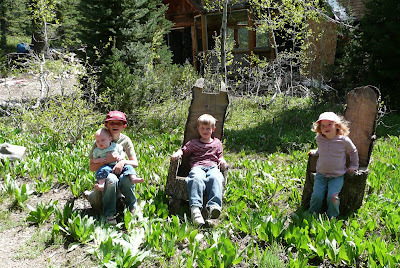 Kids all had a great time up at the cabin a couple of weeks ago, and with it getting hot here in the valley, I'm sure we'll try and spend more time up there! 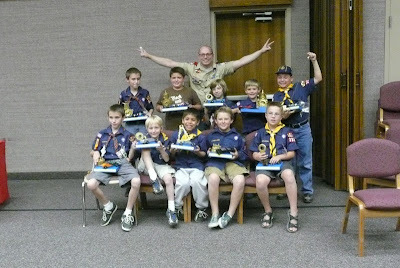 Taylor had his first pinewood derby last week. 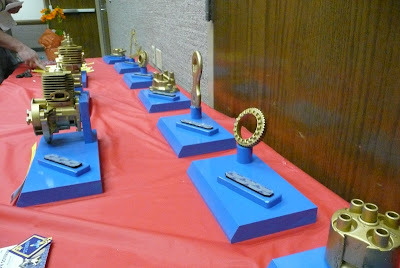 Brian spent HOURS making 10 trophy's for the event and they turned out AWESOME. 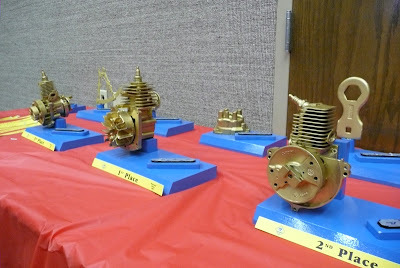 He used old "car parts" (or lawnmower parts...), sprayed them a beautiful gold color and mounted them on cub scout blue trophy stands. He had a place for the boy's car to "Velcro" to the trophy stand too. They were a HIT. The boys thought they were totally cool. Taylor and Brian spent time working on a great car for Taylor to race. He ended up taking 3rd place and he was totally happy about that! I'm still new to the whole cub scout thing, but Taylor and I are learning together and we love it so far!